Assorted Pies or A Sort of Pie? As it had achieved mediocrity on our last visit, we decided to have dinner at Independence Hall again. Our visiting HQ dude, De, was enthused as he had really enjoyed IH during an earlier dinner, providing further evidence that too much time in meeting rooms and offices can dull one’s palette and making me question our choice of DFAC. Oddly, R, another visitor from beyond does not seem to have been similarly affected by this corporate head office affliction. T happily endorsed going to IH because there he “can get a decent salad. The lettuce isn’t all white and wilted like the Monti…” Yeah, T we know. You’re fussy about your lettuce. Give it a rest dude. First I’d like to make some general comments about this DFAC. The drink cups were conveniently located about 15 ft away from the drink dispensers. What the hell? I’m not a goddamn marathon runner. This particular DFAC is probably the loudest one out there. You can barely hear yourself gag. Also, there’s no vinegar for the fries. Ok, so Americans think vinegar on fries is just plain weird but they’re wrong and clearly culturally insensitive. It’s the Dutch with their fries and mayonnaise that are weird. Glad I could clear that up. Always good to have a plan B (and C) when it comes to meat. Both De and I went for the breaded pork chop. I, realizing that it may be less than good,supplemented my protein with chicken wings and a cold kebab from the salad bar. 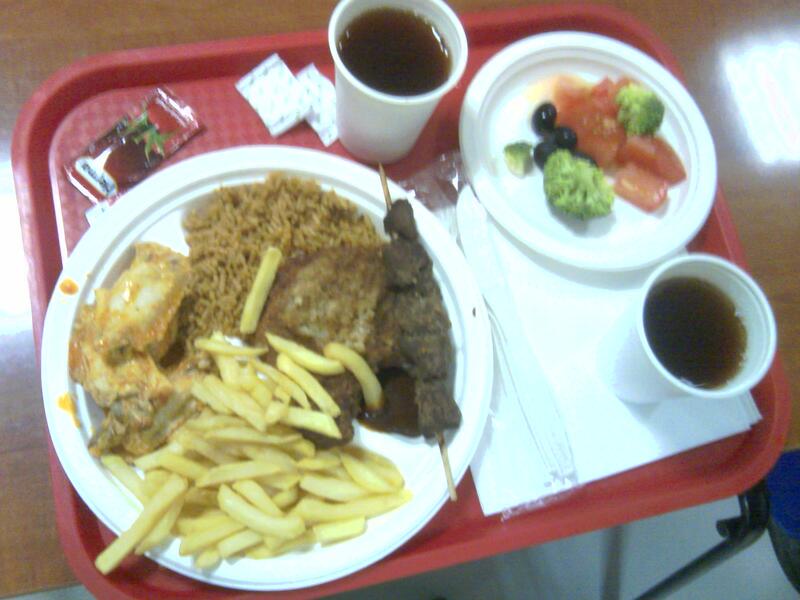 I also had fries, fried (or at least brown) rice and a few veg. The pork chop was kinda disgusting. The breading was soggy and the meat dry. De proclaimed “That pork chop is OK!” I nodded solemnly. The wings were exactly like the wings I had at the Niagara two days previously. Will I never learn? The fried or brown rice was exceedingly tasteless…it didn’t even have a rice taste. The fries were good in a vinegarless kind of way. What can I say about the kebab except that it kinda tasted like the rice? Being served cold from the salad bar did nothing to improve that particular culinary experience. R chose the pork patty on a hamburger bun. Prior to the first bite he requested “If I don’t survive this, avenge me”. He bit, he swallowed, he survived. “How’s the pork patty?’ I asked. “Processed” he answered. 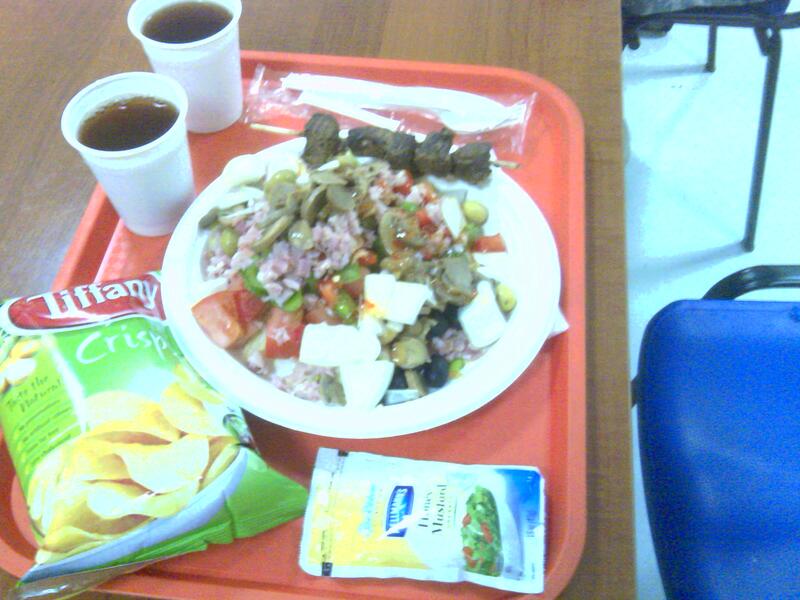 T had a nice healthy salad with a kebab and potato chips on the side. His lettuce looked mah-velous. He generously shared his potato chips with all of us at the table. They tasted a little off (stale, poisoned…I don’t know) to me so I ate only one. T thought they were fine but De agreed that there was something not quite right about them. This did not, of course, prevent him from scarfing down several handfuls. Hmm...wonder what kind I'll choose? 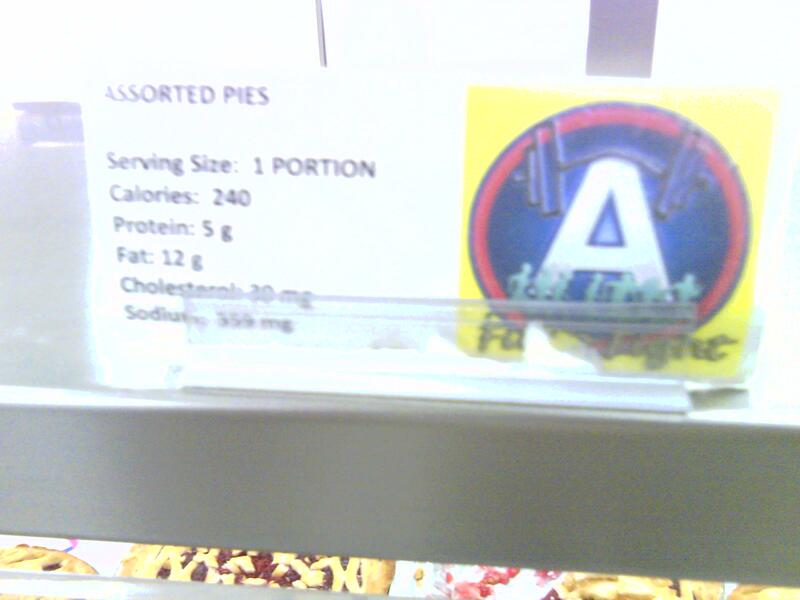 I was quite excited as I approached the dessert table and saw the sign for Assorted Pies. I like pie; who doesn’t? I mean besides terrorists and communists…they hate all good things. Imagine my confusion and chagrin when I realized that even after 48 years I don’t know the meaning of the word “assorted”. Beneath the sign, there were indeed several pies to choose from; a total of 8 I believe. I think I'll have the cherry. They were, however, all cherry pies. It was, as usual, “store-boughten” good so I guess I shouldn’t complain. But I do. Independence Hall remains an adequate place to get reliably mediocre American style food. And that is not an exaggeration. You make me giggle, and that’s not only because we’re married. I especially like the comment regarding the “poisoned” bag of potato chips. And Mark, you really should try fries with mayo. But what you do, is add hot sauce to the mayo, mix it up and then dunk your fries in it! Delish!!! And no, I am not Dutch. Malt Vinegar on fries is delicious, but I have not found a DFAC yet which supplies it on KAF; only distilled vinegar near the salad bars.